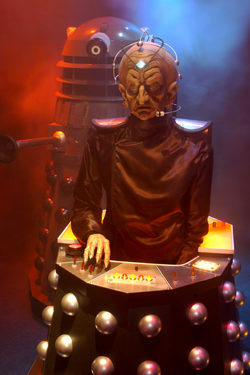 I, Davros, had an appointment to see an ATOS healthcare assessor last week. “Can I see some id please? said the man behind the desk. Davros has been confined to this chair type-thing for thousands of your earth years  cast your mind back to a time when dinsosaurs roamed the earth and Colin Baker had a size 34 waist. That will give you some kind of an idea exactly how long I’ve been… in… this… chair… in…. this… chair !! Davros has been sleeping rough after having his house reposessed after losing his benefits and a bad run on the gee-gees… house re… pose… ssed !!!! The other night in a dingy backstreet a man asked Davros to do things with him in return for twenty pounds… twenty pounds ! This would never have happened on Skaro, where Davros was pretty much a god. So Davros has finally collected enough money on the street to have a pint of Bombadier in the Crawley branch of Wetherspoons  Davros is sat next to a man who’s breath smells like Tom Baker’s undercrackers after a night on the Guinness. Night… on… the… Guinness.